For the last 10 years I "hated" Pete Carroll and his teams in that kind of sports "hate" that people reserve for umpires and players like Derek Jeter. It's nothing personal. These are the villains who make their own luck and seem to always beat the team I am rooting for. 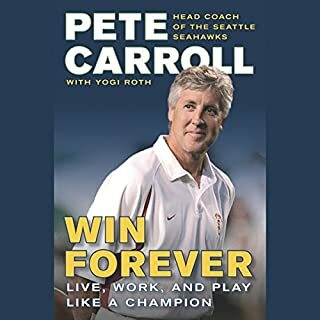 However, after listening to GRIT by Angela Duckworth, I felt compelled to learn more about Pete Carroll and his philosophy. Recently in Seattle, I could see first hand how his dreams impacted not only his players but literally *millions* of fans as the Seahawks became part of North West Washingtons identity. I really wanted this audio book to be a five out of five, and I am grateful that Mr. Carroll narrated his own work. I could not rate if 5 because well, it lacked two things. 1 - punch, or authenticity. Duckworth's performance came across like you really were sitting down and having coffee with her. Mr. Carroll's came across like you were at a press conference. I could not help but think he would have more to say, but was too seasoned to say it publicaly. 2- While his over arching view he clearly articulates, he does not provide detail. Over and over again he talks about how it his plans were supported by painstaking, meticulous detail. He does not provide details and indeed, it would probably be impossible. All the same it would have been fantastic to have ONE example. I wish he could have walked through one example to show how he translated his beliefs into a plan. I wanted to know how he communicated and got others to act with him. There were glimpses of this, but it felt like hearing math word problems described but not solved. Only occasionally was an an answer given. You know they can be solved, but you're not quite sure how to solve them yourself. I have a new found appreciate for Mr. Carroll and his work and I still recommend this book. It feels to me like his message is a clue, a sign post in a search to create excellence in ones own life. 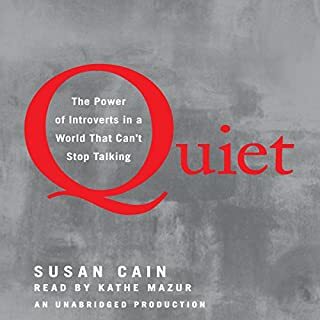 I really enjoyed this text and the tools it gave me to understand myself and my family better. Beware the "unquestioned answer". This book shows that there are more answers than the one we have been given.